While the summer weather has been a little inconsistent recently, with cloudy days and heavy rainfalls making it feel like the middle of spring, it's good to have a reminder that we're actually coming up onto the beginning of July. Whether you love the heat or hate it, be prepared for a scorcher this upcoming weekend. 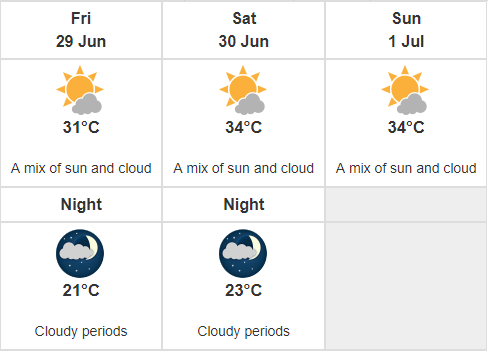 According to Environment Canada's weather forecast, we can expect temperatures in the low to mid-30s from Friday to Sunday, with a high of 34 degrees Celsius on Saturday and Sunday. The night will still be considerably warm, with a low of 21 degrees on Friday evening and 23 degrees Saturday evening. As always, residents are advised to keep cool and hydrated during hot weather, especially those who are more vulnerable to heat such as young infants and seniors. We'll update with any further developments as the weekend approaches.